Drinking beetroot juice could help the elderly lead more active lives, it has been found. In tests, they required less energy to carry out low-intensity exercises after drinking the juice. The amount of effort it took to walk was reduced by 12 per cent. This could enhance their lives by allowing the elderly to carry out tasks they might not otherwise attempt, the researchers said. 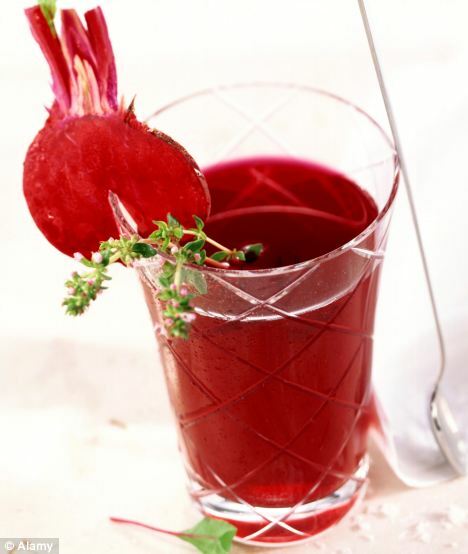 Beetroot juice widens blood vessels and reduces the amount of oxygen needed by muscles during activity. As people age, or if they develop conditions that affect the cardiovascular system, the amount of oxygen taken in during exercise can drop dramatically. A team from Exeter University and the Peninsula College of Medicine and Dentistry gave subjects normal beetroot juice or juice with the nitrates removed. Professor Andy Jones said: ‘Each time the normal, nitrate-rich juice was used, we saw a marked improvement in performance which wasn’t there with the filtered juice – so we know the nitrate is the active ingredient.